Free speech has been a huge topic of contention in recent weeks, the same weeks which saw the deaths of 75 people and violent rage across several countries in reaction to a horrendously made YouTube video entitled “Innocence of Muslims”. Debate has been rampant ever since regarding what constitutes the limits of free speech, and what rights we have, if any to offend “sacred” ideas and beliefs. New calls have been made to the UN for a Blasphemy Law and the ever-present cries of “Islamophobia!” are as tediously frequent as baby photos on a Facebook news feed. It is wrong to murder/react violently simply for being offended. A failure to stand up for this point, and this point alone, is a failure to respond as a responsible human adult. It is true that bigoted far right groups capitalise on Islamic unrest in order to advance their racist agenda and we should afford them no more than our dissent. This, however should not distract us from the genuine concerns we have with the unique and reactionary nature of Islam. Islam is a religion. An ideology. An ancient belief system. Not a race. I fear that contrasting reasoned criticism of Islam with racism, homophobia and hate speech is incredibly dangerous and lazy. Islamophobia has, to my annoyance become the buzz word for many fellow secular liberals. It’s sometimes almost robotic in its delivery, at other times a desperate pre-emptive declaration of “I’m not a racist!”, bleated solely due to the discomfort experienced by the mere mention of Islam, which is all too revealing in itself. I have one rule, and one rule only in regards to racist bigotry, and it is thus: Do not be a racist bigot. Ideas, beliefs and concepts however, especially bad ones should be valid topics for criticism, or even ridicule. I’ve lost count of the number of times i’ve heard “Yes, but do you know how many Muslims there are in the world? This is but a handful in the grand scale of things”. This is correct. Given the total number of Muslims on the planet, the actual number behaving in this reprehensible way is virtually none. Anyone with a basic understanding of base rates will realise however, this is completely irrelevant. The relevant questions are: “What is the probability that a violent religious mob will be Muslim?” What is the probability that the next person to commit suicide via explosion in a crowded area, plane, train or bus, will be a Muslim?”. It is obvious these questions have an easy answer, yet people are still committed to convincing themselves and others that all religions are the same, and any implication that Islam may be worthy of special consideration is instantly charged down with accusations of Islamophobia. Weekly headlines of suicide attacks in the middle-east are so common place as to fail to raise an eyebrow. This is frightening. I was fortunate enough to attend the recent NSS Conference in London. 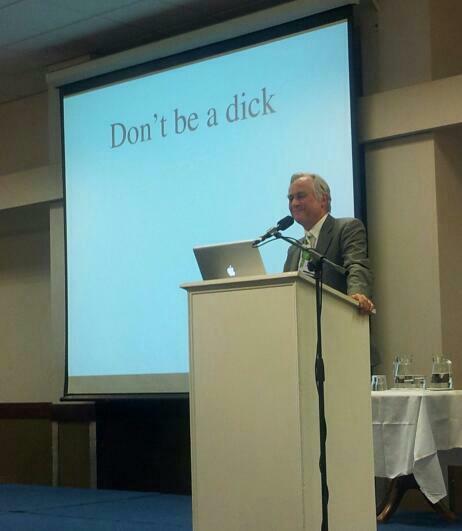 Many wonderful guest speakers were present, including Professor Richard Dawkins. Professor Dawkins is somewhat of a hero of mine, and I wasn’t going to waste my opportunity to grab a few seconds with him for a photo and a question. I was contemplating asking him a scientific question, relating to the intricacies of natural selection, or how he felt about the proliferation of faith schools, but instead settled on “Not wearing your crocoduck tie today Professor?”. Quite. Wasted opportunity aside, I was thoroughly inspired by the address given by guest speaker Maryam Namazie, which received a standing ovation. You can read it here. Maryam Namazie is spokesperson for the One Law For All campaign and The Council of Ex-Muslims of Britain. These are shining and reasoned examples of how to highlight the serious concerns relating to Sharia Law and Islamism without being a far-right crackpot. I can’t recommend enough for you to support the great and ever more important work they do. Her work ranges from opposing Sharia law in the UK, to offering support to ex-muslims. As is clear, no-one suffers more at the hands of Islamism, than Muslims themselves. This brings me to the topic of this post, a recent Guardian article by Mona Eltahawy. Mona Eltahawy is an egyptian-american journalist and Muslim, currently based in the United States. I must confess, before this incident was brought to my attention, I was unfamiliar with her work. A small amount of research has revealed her to be a champion of womens rights and a strong advocate of Islamic reform. These important and worthy (award-winning) endeavours make this episode all the more baffling. The incident relates to recent pro-Israel advertisements placed in the New York Subway, seen in the image opposite. The adverts were paid for and placed with due consideration to the relevant advertising standards and procedures by the far right group AFDI. The advert is clearly intended to be provocative (as are most effective advertisements) and by all accounts the AFDI are less than palatable in their attitudes and politics. Mona Eltahawy took it upon herself to take action against this perceived “racism and hate” by spray-painting over them, which eventually led to a less than dignified confrontation and ultimately, her arrest, all caught on camera. Please see below for the full incident and subsequent arrest. The title of Monas Guardian article is “If anti-Muslim ads are protected, so must be my free speech right to protest” with the subtitle of “I support freedom of speech – even Pamela Geller’s right to her Islamophobic subway posters. But I will always challenge hate”. One viewing of the rather unfortunate incident is enough to conclude her actions violate reasonable expectations of free speech, whilst existing firmly in the realms of criminality and suppression of free speech. Free speech does not extend to vandalism and assault. A rather bizarre argument is made in her article about pink spray paint being somehow an exception to vandalism. Vandalising or attempting to deface a legally placed statement, however distasteful you may find it, is nothing short of censorship. Censorship goes against the very essence of free speech. In what can only be described as something that resembles a tantrum of toddler sized proportions, Mona fails to realise that free speech is also there to protect the things she doesn’t want to hear or see too. In contrast, and also a lesson in class, the response from the Jewish human rights group, Rabbis for Human Rights, can be seen in the image on the left. The group decided to respond by creating these pro-Muslim posters. This is clearly a more reasoned and dignified method of responding to ideas you disagree with, not to mention more effective. Not only are the Rabbis for Human Rights promoting a more positive message, but have also smartly managed to distance themselves from the far-right sensibilities of the AFDI. Opposing viewpoints being granted the freedom to inhabit the same space and means, without violence or censorship is vital in order to foster discussion and debate. It appears that Mona, by reacting in this criminal and hot-headed manner, has accomplished nothing except embody the traits of Islam that are currently cause for so much concern: Reactionary, destructive and anti-free speech. I fear this kind of behaviour will only serve to fuel the momentum of far right groups such as the AFDI in a time where vocal Muslim advocates of free speech are desperately needed. Please take a moment to cast your vote on the poll below. I am a bit confused over the whole subject of free speech. It seems that whenever someone (especially those with authority/money) dislikes/disagrees it automatically becomes hate speech, which mathematically cancels out free speech? E.g. look at the whole case of Holocaust denial (which is illegal in a lot of countries). Seems that most people involved in Holocaust denial are actually Holocaust scale deniers at worst? The reason people will make the argument that questioning the numbers (by order of magnitude) or the extent of the Holocaust is Anti-Semitic is because there is no informational-based reason to do so. There is such an impressive quantity of documents, physical evidence, courtroom and out-of-court testimony, specifications and blueprints, and governmental memoranda that demonstrate that between 5.2-7.5 million Jews (usually presented as a round 6 million because most numbers converge there) and roughly 5 million Non-Jews were systemically murdered by the Nazis (and parallel groups like the Croatians and the Bosniak Handschar). Conversely, if we look at every group that engages in Holocaust Denial, they point out (elsewhere) that they either (1) hate Jews, (2) love Fascism, Nazism, or White Supremacism (which also implicate Jew-hatred). I agree with Mona’s action here. It’s not like there’s a systematic abuse going on with this particular line of attack. This is not cultural vandalism. So, in my opinion, vandalism isn’t always right at a cultural level. When it happens in support of free speech, it is the exception. And that makes it all the more important. That Israeli ad is a disgrace to humanity. Support the “civilized man” in killing the savages (including: Children and the elderly)? I don’t agree with Mona, but just because she’s wrong, the other side is not necessarily right either. the only difference is while she’s vandalizing, The Israeli army is committing WAR CRIMES on daily basis and nobody bats an eyelid. Disgusting. I don’t think Spellchecker was saying ‘the other side’ was wrong, just defending the legal free speech (the ad) vs the illegal vandalism. And I agree. I liked the stickers people were quietly putting up over the ads. Screaming tantrums and pink spraypaint are a bit over the top. Sometimes the sentiment gets lost in the expression, and that’s never a good thing. As reprehesible as the poster might be, the right to free speech affords it the right to be there. Protesting should involve using the right to free speech also. Not censorship. Put up a poster next to it highlighting how offensive the poster is. Ridicule the groups viewpoint. Show them up to be bigots. Don’t pretend you have the right to censor peoples’ thoughts. Educate them. Top summary Mr Richard Hughes. Spot on. I am very fond of post-Enlightenment civilization and the protections that it provides me. One of those protections is free speech, and another is the right to property. Ms. Eltahawy took it upon herself to violate the legally understood definition of free speech, and to commit vandalism. Thus, what she did was clearly wrong in both a legal sense and, I would argue, in an ethical sense. That said, a political group referring to other human beings as “savages” is astonishingly childish and vile. Undecided. On the one hand it’s wrong to label anyone savages, or to have this kind of message in a civilised country, but on the other hand, they’re only words, and (I’d hope) the vast majority would see through that kind of sweeping generalisation in the same way most sports fans wouldn’t react to abuse/mockery levelled at them from opposing supporters. I’m sorry, but I got to 2:50 in the video before I switched off. She would have been more honest in her actions and intentions if she’d donned a nappy, climbed into a pram and started throwing the toys out. First of all the “savages” mentioned in the poster refer to jihadis. Secondly, I would like to point out the “classy rabbis” referred to in this (excellent) article were merely following the reasonable and rational example already set by the AFDI. Insofar as these ADFI posters were in direct response to a series of anti-Israel posters which adorned the walls of the NY subway. So instead of doing a Mona the ADFI raised money to support its own advertising campaign and responded to speech they found distasteful with more speech, which is the civilized thing to do. I think theres a grey area in some of these free speech issues to do with intent and motivation but free speech has to be maintained. Free speech is a crucial right that many of the others hang off but sometimes theres got to be some element of broader values. There will be a lesser value and rather less protection of free speech that overtly threatens humane values when combined with an element of incitement to violence. Now theres direct incitement to violence which should clearly not to be supported in speech and there’s the case of indirect incitement which is much less clear. The latter could be a matter of judgement (i.e. authorities might decide for it not to go up if its judged to encourage violence or extreme discrimination but this has to be judged against damaging free speech culture so should be on a case by case basis). I think it was right for the poster to have been allowed but if it were to become the subject of significant unrest or major community dissension it and similar messages could be disallowed by authorities – so each type of thing that is hurtful and potentially incites bad behaviour towards a group or society as a whole is unofficially considered on a case by case basis – and also on the basis of whether the objections to the message have some primarily anti humane character. Sometimes there is legislation on specific areas of such expression but again it needs to be interpreted. Once the offensive message is up and its decided it shouldn’t have been up, it can’t be removed but just don’t put up more in future. The valuations should always be about maintaining a humane liberal culture and society. So if the objection is anti humane and anti liberal too bad the messages keep coming. Again, apart from specific legislation on say, blatant racist speech directed at individuals and intended to intimidate, the decision on free speech is ultimately not official – its ultimately informed by the culture and culture doesnt have to have legal precedent and endless haggling over everything and something we need to keep debating without being shut down.